On the outskirts of Toronto, two gentleman are in a darkened corner of an after hours club. They’re talking about the family myth: the big pink elephant that has occupied a prominent space in their lives for nearly a quarter century. The two men who are waging this valiant struggle are Josh Reichmann and James Sayce. Over the years, they’ve watched friends and contemporaries lose their sanity or simply just disappear as they cope with the weight of the family myth. 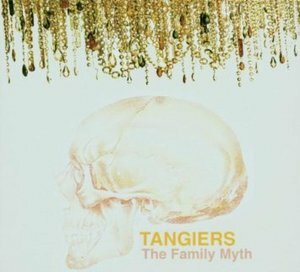 It was 3 years ago Sayce and Reichmann formed a band, called it Tangiers and tried to put the family myth behind them. They put out two albums, everyone seemed to like the records but the weight of carrying such a dark and tumultuous rock on their shoulders caused the band to seek inspiration and solace outside of their native land. It was fall of 2004 when Syd Butler and Frenchkiss Records called to offer the band a chance at salvation. He invited the band down to New York City to record an album, and introduced them to a figure by the name of Chris Zane. Zane, who had worked with Butler’s Les Savy Fav as well as Calla and Ambulance Ltd, was to helm the project at New York’s Gigantic Studios. It was now decided that Reichmann and Sayce would take on the family myth head on. However, something was missing from these sessions in New York; in a bold and valiant move, under the cover of darkness, Tangiers snuck Zane back across the border to Chemical Sound Studios in Toronto to finish recording. If the band were to wage war on the myth that has plagued them, then they were going to do it on their own soil. They enlisted the help of Jon McCann who used to run with Guided By Voices and Shelton Deverell to help on drums and keyboards respectively. The result you ask? Well, an album with dark, romantic melodies, cryptically scathing and at times humorously literate self-deprecation, their consciousness of self never seeming self-conscious. Both Reichmann and Sayce take stabs at dispelling the family myth. Sayce delivering hook laden pop songs about historical events and atrocities while Reichmann’s dark, brooding and often chaotic songs take a more literal stand against the myths power. Celebratory and heartfelt, The Family Myth’s references are apparent, like The Fall and the Zombies being fronted by Leonard Cohen on amphetamines. While the indie canon is well represented, this never overpowers the band’s vision with their sound not out of place with contemporary music. After releasing two albums, touring with the likes of Frank Black, Trans Am, The Constantines and The Walkmen, Tangiers will be embarking on a North American tour this fall. The Family Myth is unleashed in Canada on October 4th through the newly formed Baudelaire Label and in the US on October 18th through Frenchkiss Records.